The following settings are contained within the Attributes page of the Creating a New Part Reference dialog box. The attributes you set in this dialog will be applied to the entire part reference. Note that you cannot modify the attributes of a specific entity belonging to a part reference (Part Reference Entity). Similarly, you are also unable to blank individual elements of a part reference, which will be useful to remember when creating drawing layouts containing referenced geometry. Width – Allows you to set a new line width attribute. To set this attribute, select the desired width. Style – Allows you to set a new line style attribute. To set this attribute, select the desired style. Color – Allows you to assign a new color attribute. To set this attribute, select the desired color square. Level – When enabled, this setting allows you to select a new active level. Set From Ent – Allows you to select an entity whose attributes will be used on the new entity. Pen – Allows you to assign a new pen number. 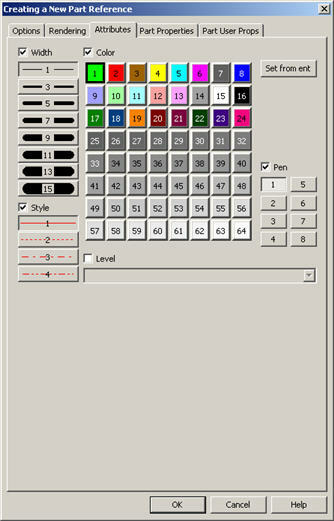 To set this attribute, select the desired pen number.